It’s all about the beignets!!!! Get yours at Cafe Du Monde which is open 24/7! They are located in the French Quarter at 800 Decatur Street. 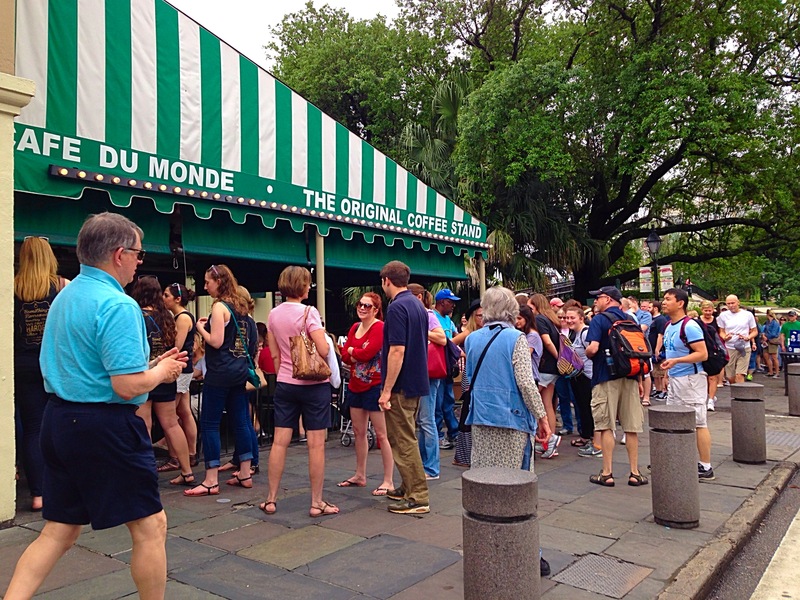 Cafe Du Monde started out as a coffee stand in 1862 in the New Orleans French Market serving just four items: coffee, beignets, orange juice and chocolate milk. At the coffee stand, customers could order coffee one of two ways, black or au lait. 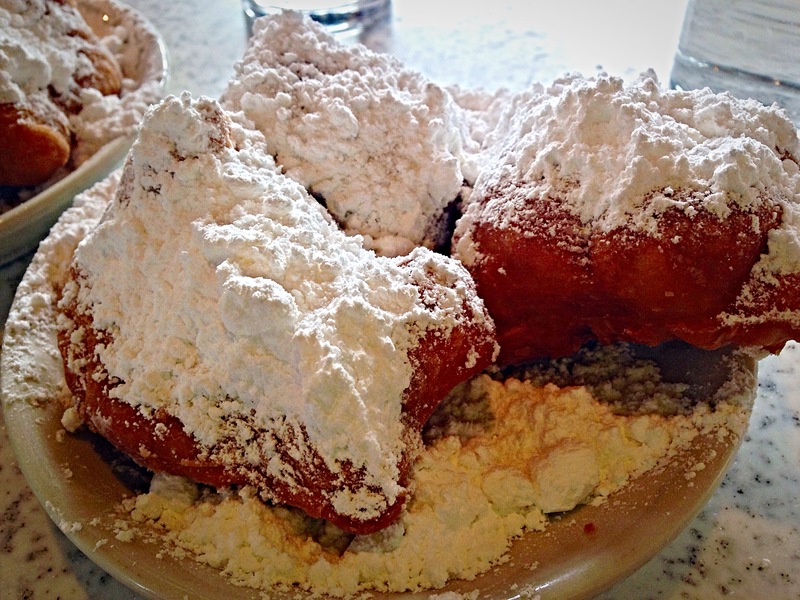 Today, Cafe Du Monde is known for their world-renowned beignets covered in powered sugar. I was surprised that the beignets don’t taste greasy at all. Warning, your face and clothing will be covered in powdered sugar. There are two separate lines at Cafe DuMonde, one for to-go orders and the other to sit down and enjoy your hot, fresh beignets. The line is very long at all times but moves along surprisingly fast. The line closest to the street is the dine-in line and the line along the backside of the restaurant is the to-go line. We thought that we were in the to-go line and discovered that we were actually in the dine-in line. So, we took a seat and ordered our beignets! I am glad we were able to take in the full dining experience of watching everyone cover themselves in powdered sugar. Beignets~ the word “beignet” also know as “boules de Berlinis” or “fritelli”, is a French term which translates to fritter. Usually made from dough (choux or yeast), deep-fried and dusted with powdered sugar, beignets are most commonly consumed as a breakfast food. Beignets must be eaten fresh and hot. In New Orleans, beignets have become a big part of the creole cuisine. Beignets are often made with fruit or jam fillings. At Cafe Du Monde, beignets are served in an order of 3. In 1986, beignets were declared the official state doughnut of Louisiana. 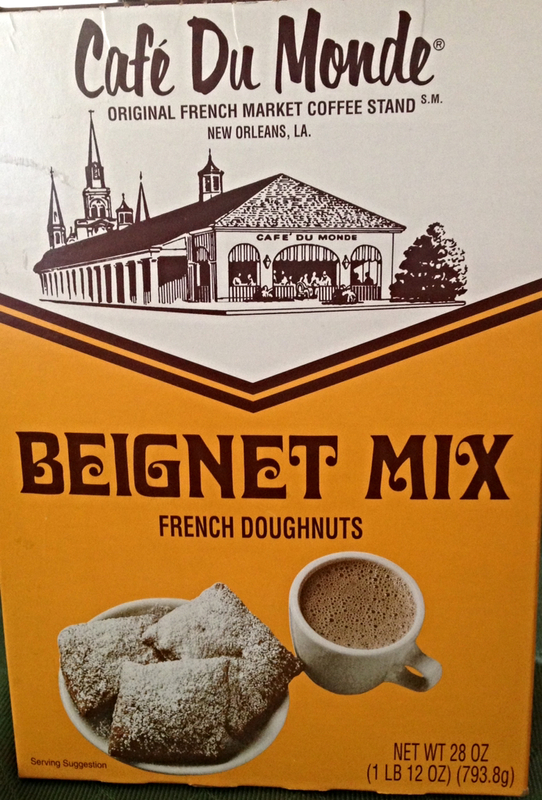 Pick up a box of Cafe Du Monde beignet mix at any souvenir shop in New Orleans. Chicory~ What exactly is chicory? Chicory has a chocolate flavor to the coffee, but actually is made from roasting and grinding the root of the endive plant (lettuce). Chicory not only adds a greatly chocolate flavor, it also reduces the bitterness of dark roast coffee. Chicory was discovered by the French during their civil war. Since coffee was not abundantly available during that time, the French creatively added chicory to supplement their coffee. The Acadians are credited for bringing chicory to Louisiana in the 1700’s.